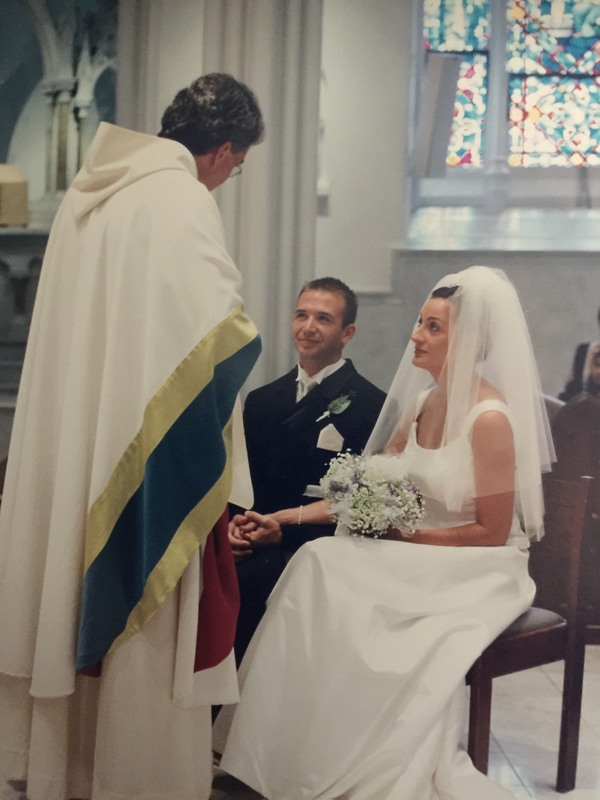 Below hear from Steve Smith (’99) and Josette Todaro (’18) whose 20 year marriage began with a beautiful wedding officiated by Villanova University Presdient and former Theatre Department Chair Rev. Peter M. Donohue, OSA, PhD. Father Peter plays Master of Ceremonies at Steve and Josette’s first performance as husband and wife. My wife Josette and I met in a production of The Tooth of Crime by Sam Shepard, directed by Joanna Rotte in 1996, although we did not start dating until 1997. I was the drummer in the “band” and she was an actor in the show. I received my MA in Theatre from Villanova (1999) and Josette finished her course work in 1997 and just recently completed her orals and received her MA by directing a production of Samuel Beckett’s Happy Days, in which I played the role of Willy. I went on to get my MFA in Acting from the University of Delaware and Josette has an MFA in Film from Temple University. We have worked on many theatrical and film productions together over the years and we love spending time with our two children, Phoebe (13) and Trevor (11). We were married at Villanova by Fr. Peter in July of 1999. One of our favorite memories is of our wedding rehearsal dinner, which took place in Vasey Theatre! Here is a photo of Father Peter and us at our wedding. He also baptized our daughter Phoebe, and Father David baptized our son Trevor. Our 20th wedding anniversary will be in July 2019!